Truffle cheese is any type of cheese that has been flavored with truffles, a culinary fungus that grows underground and is highly prized by chefs and foodies. Truffles have an earthy, garlicky, nutty flavor and are aromatic (some might say pungent). Truffle cheese is flavored with either truffle shavings, truffle oil, or both. Any style of cheese made from any type of milk can be flavored with truffles. Sottocenere: A strong truffle aroma is followed by a slightly milder truffle flavor in this semi-soft Italian cheese with specks of black truffles. Adding to the truffle aromatics is a blend of nutmeg, coriander, cinnamon, licorice, cloves and fennel that has been rubbed into the rind. Moliterno Black Truffle Pecorino: A Sardinian cheese featuring the earthy, nutty, salty flavor of pecorino (sheep's milk cheese) layered with black truffle paste. The truffles can be seen in dark lines throughout the cheese, which is made using raw sheep's milk. 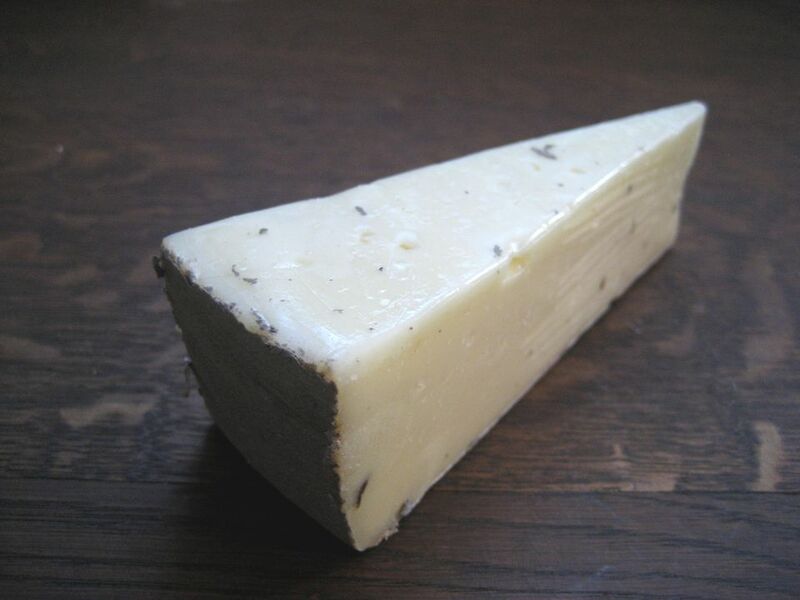 Boschetto al Tartufo: A semi-soft Italian cheese made from a blend of pasteurized cow and sheep milk. The cheese is mild which allows the shavings of white truffle to dominate the flavor. Truffle Tremor: This pasteurized goat's milk cheese has a soft, fluffy texture. Flecked with bits of black truffle, it is made by Cypress Grove in California. Truffle and Salt Cheddar: An aged, pasteurized cheddar made with black truffle salt. Created by Ballard Family Dairy and Cheese in Idaho. Grafton Truffle Cheddar: This classic Vermont cheddar is flavored with truffle shavings. Truffle Gouda: This Dutch Gouda is flavored with little flecks of black truffle. Less sharp and sweet than some types of Gouda, the cheese has a flavor that doesn't overpower the truffles. When serving truffle cheese, keep the presentation simple so the truffle flavor can be in the spotlight. Don't bother with much more than a sliced baguette or plain crackers. Adding a glass of sparkling wine or pinot noir can add to the pleasure of eating truffle cheese. Semi-soft and hard truffle cheeses can be used to flavor a variety of dishes. Grate truffle cheese over eggs, pizza, or pasta, as seen in the baked truffle mac 'n' cheese recipe. You can also use truffle cheese in grilled cheese sandwiches and risotto or melt it into a fondue. White truffles are the most expensive, followed by black truffles. Harvesting truffles is a slow and labor-intensive process and this affects the cost. Truffle hunters roam through hills and forests with their trained truffle-sniffing dogs, who can sniff out the buried treasures growing in the wild. Many countries also cultivate truffles with mixed success. Farming truffles is not easy, and the result can be inferior truffles on the market. Considering the high cost of truffles, truffle-flavored cheese is relatively affordable. Most truffle-flavored cheeses contain only a tiny amount of truffle, but the flavor and aroma of truffles are easy to detect.